The tea houses and restaurants are closed throughout the day. Tourists take their meals in the seclusion of Has Bahçe or buy snacks from a grocer. There is brief excitement in the downtown market each morning as local gardeners arrive with their produce – eggplant, peppers, tomatoes and melons, and more recently, figs, grapes and apples. Around the same time, a herd of sheep, goats and cows moves slowly along the far bank of the river for mid-morning watering by the pylons of the old Artukid bridge. By mid-day, the heat is enervating, but friends tell me their thirst and exhaustion are reminders to offer thanks. Men of all ages pass the hottest hours of the day in the mosque, dividing their time between rest, prayer and Qur’an recitation. 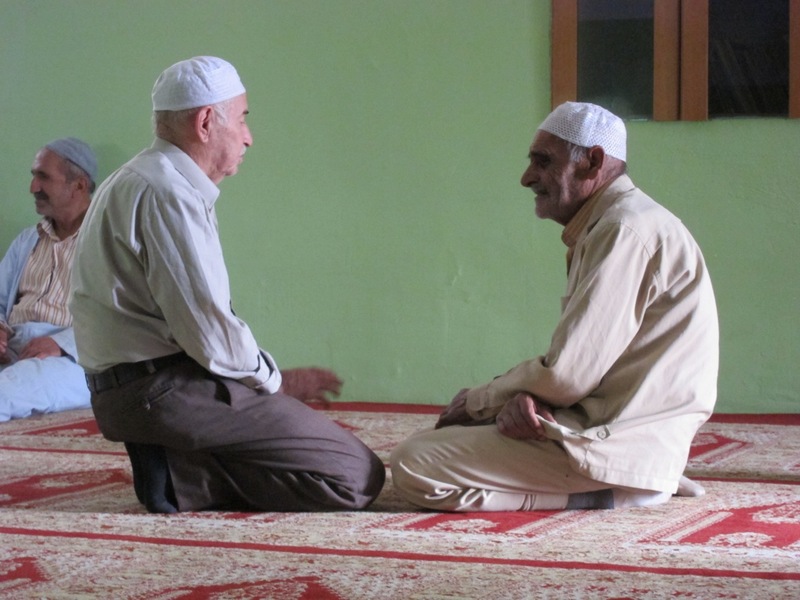 Conversations treat familiar theological topics: respect among different religions, the completion of the Semitic prophetic tradition with the Qur’an, the status of Jesus in Islam and Christianity, etc. Ramazan is a physical and emotional challenge, and Hasankeyf is a good place to test one's endurance. Iftar – the evening meal that marks the end of the day’s fast – might be taken on the edge of the river or in a shaded garden populated with noisy ducks and mischievous sheep. But the best place for iftar in Hasankeyf is a rooftop terrace just above the Rizk Mosque. The broad panoramic sweep of Anatolian history unfolds in soft orange light – the Byzantine castle, Artukid bridge, Ayyubid mosque, Akkoyunlu tomb, Ottoman hamam. The call to prayer, echoing here since 639 CE, signals the end of another leg of this month-long journey. In the evening, it’s back to the market for tea, water, fresh fruit. 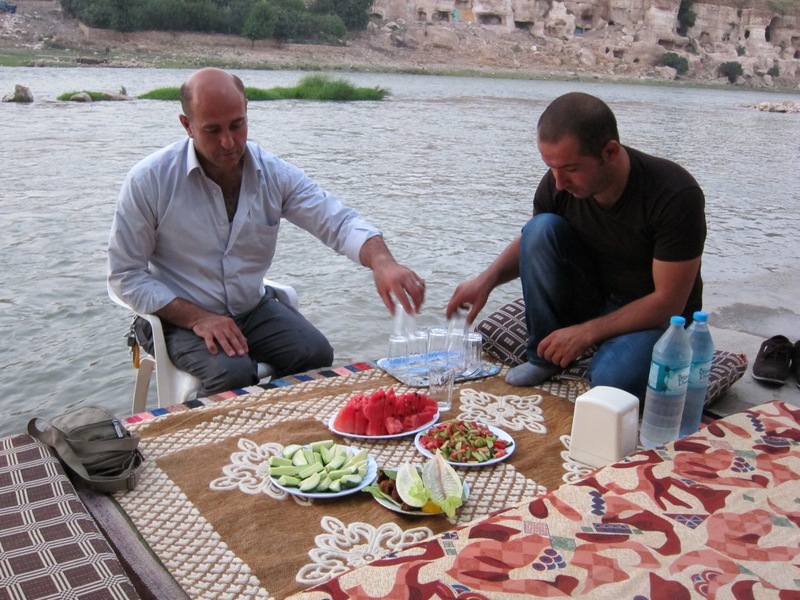 On the terrace overlooking the river, the conversation is generally in Arabic, and the songs, alternating between spiritual devotion and melancholic longing, are Turkish and Kurdish. There will be no singing on the terrace this evening. It's the Night of Destiny, and most Hasankeyf residents will congregate in the mosques to listen to the reading of the Life of the Prophet. John, What an interesting time to be in Hasankeyf but, I imagine, a bit challenging. Lovely descriptions in this posting. Thanks for following us, Senior Dogs! Sure, the heat is challenging, but it seems that just about any month of the year is a good time to be here. Any chance you'll join the tour later in September?